Tel. 01454 853566 or 07850 846919 ? Software for creating charts for Cross Stitch and tapestry. Suitable for drawing or photo conversion. Versions available for producing hand stitch charts and machine embroidery files. Software for creating charts for Cross Stitch and tapestry. Suitable for drawing or photo conversion. The same version produces both hand stitch charts and embroidery machine files. It can create realistic stitched views, high resolution charts, fully customised colour keys and thread organisers. If you can't wait for a delivery, you can purchase our software products from MyCommerce for download. You will receive download link and serial number by automated email. Please note that download software is taxed at the rate of your country of residence and not the location of the vendor. You will be able to see the final price before you commit to purchase. 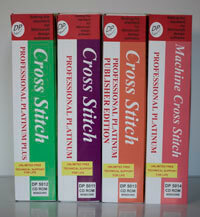 DP Software direct online store for boxed products sent from the UK. We have CD and USB multilingual versions with English manuals (German available on request). Software contains PDF versions of manuals in English and German. The English version can switch to French, Portuguese, Spanish or Italian and most items are translated but there are no translated manuals. PDF version of Danish and Norwegian manuals. Supplied on USB device. We give you a year of free downloadable updates when you register your software. After that, you can purchase additional years of updates either as single years, 5 or 10 year bundles or an annual PayPal subscription. The current cost of subscriptions is $10 per year except for Publisher versions $30. These updates cover all our new releases which are frequent incremental updates rather than saving all the updates for one chargeable new version. This way we can bring you new features more quickly without a sudden increase in number of bugs and you don't need to worry what the best time to purchase is.